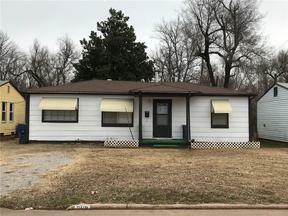 Nice starter home or great investment house. Recently painted. Close access to I-35 to get to Downtown Oklahoma City or surrounding areas. Garage was converted to add an additional 220 MOL sq feet. Seller is not aware of any repairs and does not want to make any repairs. Buyer is welcome to do an inspection. Dishwasher, washer, and dryer are included! Seller reserves the refrigerator, stove, and standing gas heater in living room.